Situju a newly built boat that combines traditional style with modern technologies. Small boat's capacity guarantees you will get personal care. 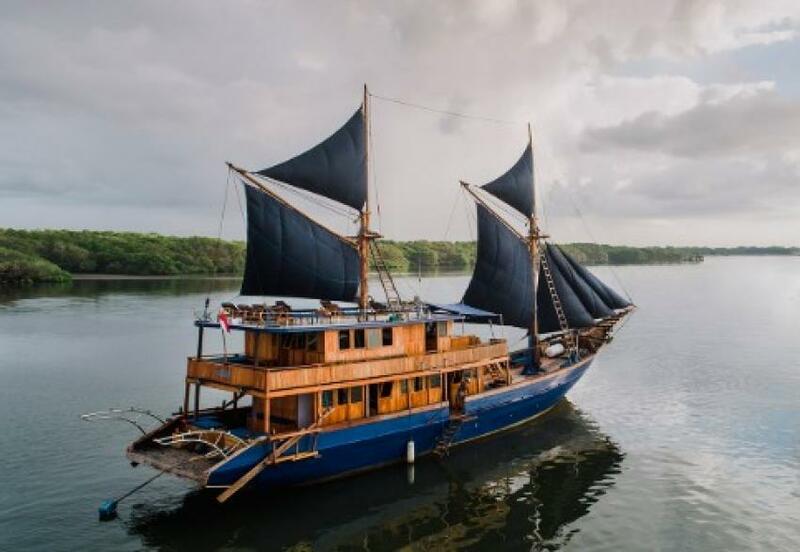 She offers small trips to one of the most wonderfull Indonesian destination Komodo Island. Trips can be easily combined with a land-based vacation. The boat can accommodate up to 10 divers on board. there are only 5 cozy convenient cabins. Two deluxe staterooms offer double accommodation. as well as Junior Suite that is slightly bigger. Also, there is a twin bed cabin. If you prefer more luxury accommodation then you will appreciate a Grand Suite, located on the stern, that offers a large private terrace. All cabins have a private bathroom an air conditioner. Situja doesn’t have big common spaces, but you will love to stay on the upper deck, relax and watch the sunset. You can also use wifi on board. Of course, it is not always available due to the distance from the shore. Situja equipped with all necessary safety equipment 20 life jacket, 1 lift raft capacity 20 persons, etc. Situja main itinerary is Komodo Island. She offers trips that begin or end on Bali, so you don’t need a domestic flight. Other trips start and end in Labuan Bajo, And due to its duration they can be easily combined with land accommodation. You can continue to discover Komodo and nearest islands or make a trip to other exciting Indonesian destinations. Komodo is well-known between divers. Underwater landscapes formed by numerous volcanic actions are stunning. Seamount, pinnacles, reefs, and walls. You can find lots of macro species like nudibranchs, tiny octopuses and pygmy seahorses. Dolphins, mantas and turtles can be met. Situja suits for nondiving passengers as well. You can visit local villages, be introduced to Indonesian tradition. And of course, the main attraction is Komodo dragons the larges lizards in the world that lives only here.